The Somerset County Conservancy preserves the open spaces and historic places that are so essential to our county’s quality of life by working with citizens, community groups, private landowners, municipalities, and state and federal agencies to promote and implement open space and natural resource protection, green urban planning, agricultural land protection, innovative sustainable land use practices, preservation and/or adaptive reuse of historic structures, wildlife habitat, restoration, and best land management practices. the conservancy uses the Somerset County Natural Heritage Inventory as part of the process when deciding on properties to preserve. The latest inventory is available here for reference- Somerset County Natural Heritage Inventory. When the Conservancy assumed responsibility and liability on several impacted properties, we were able to acquire federal and state funding for construction of the Somerset County projects listed below. Approximately 2.1 million dollars was spent to construct these five passive treatment systems. Today these projects remove 111 tons of iron, 78 tons of aluminum, and 886 tons of acid per year from the Stonycreek River. 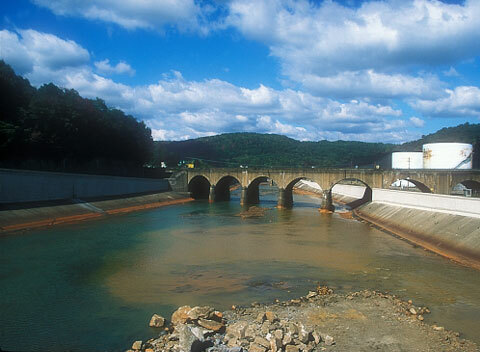 This significantly improves the quality of the water in the scenic and historic Stonycreek River, which is used for drinking water by several communities. For the first time in decades trout are living in the stream near Hooversville. Click here for an overview map of all our properties. The Oaks Trail Project was the first property acquired by the SCC. The property was acquired to facilitate the construction of the Oven Run stream remediation project in early 1995. Without the willingness of the Somerset Conservancy to accept ownership, the project would not have been completed. The project was designed at the USDA, Natural Resources Conservation Services’ (NRCS) Technical Office in Somerset. Construction of the project was started on July 12, 1995 and completed on Sept. 21,1995. Stoy Excavating was the contractor for the project. NRCS administered the contract and inspected the project while under construction. The final cost of the project was $232,066. The project treats a 50 gallon per minute (GPM) flow of acid mine drainage (AMD). The passive treatment system effectively raises pH, and alkalinity and lowers iron, aluminum, and acidity. Other long-term benefits of this project are educational opportunities and wildlife habitat diversity. The Mountain Laurel Chapter of Trout Unlimited contributed $5000 to construct an interpretive trail. The local chapter also obtained a $5000 matching grant from National Trout Unlimited for the trail. The trail includes signs that describe what processes are happening in the treatment system as the trail follows the flow of water through the system. Tours are given annually by Conservancy members to government agencies, local school districts, colleges, universities and professional groups. The Oaks Trail AMD passive treatment system has also created wildlife habitat for waterfowl. Every year since the system was constructed, there have been successful nestings by Canada geese, wood ducks, and mallards. Songbirds have also benefited from the site; bluebirds and cedar waxwings can frequently be seen using the area for nesting and feeding. construction cost for the project was $1.1 million. Once again the Somerset County Conservancy Board of directors stepped forward and took ownership of the project. The system was designed to treat 350 GPM. Construction occurred in 1998 and 1999. The mine water chemistry at this site is very difficult to treat with passive treatment systems. The pH ranges from 2.7 to 3.0, acidity ranges from 500 to 800 mg/L, iron ranges from 50 to 90 mg/L and acidity from 35 to 55 mg/L. The Oven Run Site “B” passive treatment system is not currently producing water quality as good as originally anticipated. However, it is still providing substantial benefit to the receiving streams by removing approximately 110 tons of acidity, 15 tons of iron, and 6.5 tons of aluminum per year. coal processing plant. The SCC obtained the property in early 1999. Without the willingness of the Somerset Conservancy to accept ownership the project would not have been completed. The project was designed at the USDA, Natural Resources Conservation Services’ (NRCS) Technical Office in Somerset and was completed in 2000. Casselman Enterprises and Commonwealth Stone Co. were contractors for the three phased project. NRCS administered the contract and inspected the project while under construction. The final cost of the project was $616,996. The project treats a 100 gallon per minute (GPM) flow of acid mine drainage. The passive treatment system effectively lowers iron, aluminum, and acidity and raises alkalinity and pH. This project represents a collaboration of efforts between Office of Surface Mining, the Pennsylvania Department of Environmental Protection, the Southern Alleghenies Conservancy, Somerset Conservation District, local sportsmen’s clubs, Reliant Energy, and the SCC, the present landowner. The total cost was approximately one million dollars which included design, engineering, and construction costs. This system treats a large abandoned deep mine discharge which is net alkaline but there is also a large iron concentration. 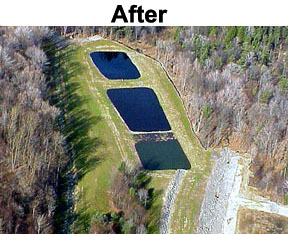 The only treatment that is necessary is retention of the water within the constructed wetland. The project also separates good quality water in an adjacent tributary, Beaverdam Creek, from the discharge. The current information shows the system is successfully treating about 1600 gallons per minute by reducing the iron dissolved in the water from 25mg/l to about 1mg/l. As a direct result of the Mallard’s Rest treatment system, trout are now stocked in a four mile section of Quemahoning Creek downstream from the system which had not been fished for almost 100 years! 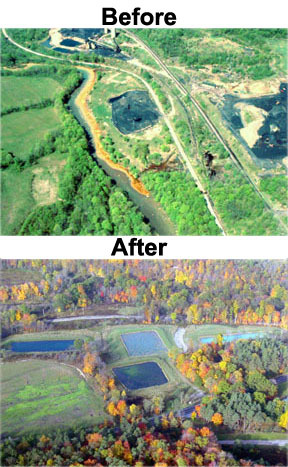 The Lamberts Run acid mine drainage treatment project is located adjacent to the Flight 93 Memorial. 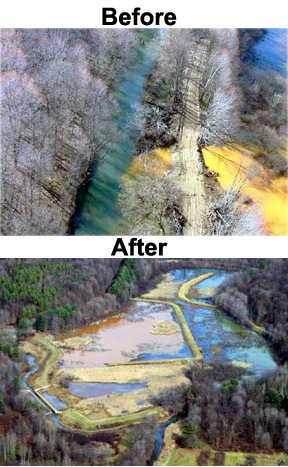 The Somerset County Conservancy acquired 49.98 acres on July 28, 1998 for the purpose of treating acid mine drainage. The land was donated to the Conservancy by PBS Coals Inc. PBS Coals Inc. provided the construction of the site through the work in-lieu-of fine program. The system treats a 50 gallon per minute flow of acid mine drainage. The Natural Resources Conservation Service designed a passive treatment system to treat the discharge. The system has been in operation since 1998. The Somerset County Conservancy came into existence in 1994 because of a need for someone to own passive mine drainage treatment systems constructed by various local, state, and federal agencies. The Conservancy currently owns 5 systems that treat 2310 gallons per minute (GPM). In total, the systems remove 23 tons of aluminum, 127 tons of iron, and 315 tons of acidity from the Stonycreek River. In addition to removing these pollutants, the systems add 105 tons of alkalinity to the Stonycreek. To put this in perspective, the combined pollutant load removed from the Stonycreek River equals 20 tri-axle dump truck loads removed from the river every year. 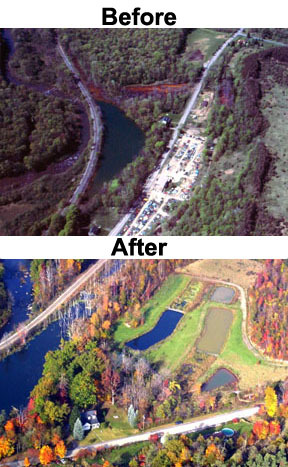 The result of this pollutant reduction is 20 miles of the Stonycreek River restored to a viable fishery, much of it a trout fishery. Four miles of Quemahoning Creek has also been restored to a trout fishery. Stream surveys by the Pennsylvania Fish and Boat Commission show a continual increase in the number of fish species and individual fish in the Stonycreek River all the way to the Stonycreeks’ confluence with the Little Conemaugh River near Johnstown. These benefits to the Stonycreek are in part responsible for the restoration of the fishery in the Monongahela River in Pittsburgh. The AMD passive treatment systems which have been constructed in Somerset County due to the efforts of SCC and many conservation-minded partners continues to have a positive impact on streams and watersheds in Somerset County and other Southwestern PA counties as well. The following chart shows the pollutant reduction by site. 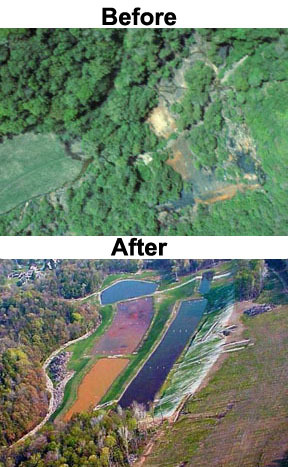 The picture below the chart shows the dramatic difference in water color and quality at the confluence of the Stonycreek River with the mine drainage-impacted Little Conemaugh River. Clean water of the Stonycreek River on the left, mine drainage from the Little Conemaugh River on the right. The Somerset County Conservancy is proud to be part of this dramatic and historic stream restoration.